Cotton, courtesy of the USDA. What do electrons have to do with our ability to spin this into yarn? Plants are hard. Not in the physical way, but in the genomics way: It’s been estimated that 75% of domesticated plant genomes are polyploid, meaning they have up to 12 sets of each chromosome in every cell. This makes genome sequencing crazily difficult: Each gene segment is represented multiple times, and each one has changes between them, since these organisms multiplied their chromosomes millions of years ago. for Biotechnology (and my employer), through our backyard cotton field. Every genome sequence has errors produced along the way; it’s just a factor of the technology and the scale involved. When you are trying to read the genome of a plant and you see a nucleotide position with multiple bases supposedly reported by the sequencer at that position, how do you know what’s real and what’s error? Enter comparative genomics. Scientists around the world are attacking this problem by sequencing as many different plants as possible and comparing the genomes to each other across evolutionary time. This week, the plant in the spotlight is cotton, or the Gossypium genus. Scientists from 10 countries collaborated to produce a draft genome sequence for Gossypium raimondii, which produces a non-spinnable variety of cotton fiber. The cotton genome produced is much larger than other plants that have been sequenced – poplar, rice, and grapevines – and in this case 61% of its genome size comes from repetitive elements, which are also quite hard to incorporate into a genome sequence. It’s a little like putting together a multi-million piece jigsaw puzzle where over half the picture is blue sky. In the unique parts of the genome are over 37,000 genes, which is at least 10,000 more than humans. 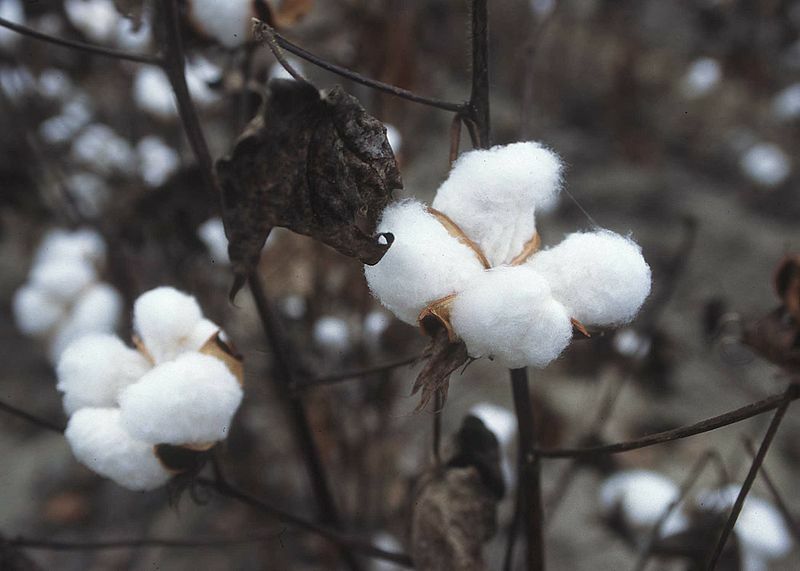 By comparing this more complete genome sequence to other plants, the researchers can conclude that what we now know as cotton has gone through multiple transformations. At least 60 million years ago, its ancestors diverged from other plants and went through an abrupt chromosome multiplication, to have the five or six sets of chromosomes we still see today. Then, about 5-10 million years ago, fibers with a structure that allowed them to be spinnable into yarn evolved in some cotton subgroups and not others. To investigate what makes spinnable cotton, the researchers produced some genome sequence for a number of representatives of these subgroups. Intriguingly, they saw linkage between fiber quality and a block of mitochondrial genes that had transported to the nucleus of some cotton strains. Mitochondria are the structures in the cell that take nutrient energy and package it into molecules that cells can use as an energy source. In the case of cotton, the co-opted mitochondrial genes relate to the way cells like ours and those of plants generate those energy-containing molecules, by transport of electrons through certain enzymes (like NADH dehydrogenase for you aficionados). There is no obvious connection between the observations about electrons and the spinnability of cotton, though, leaving open the question: Can this passage of electrons from protein to protein really be involved in allowing our own ancestors to start making clothes from cotton? Now that these genome data have been released, anyone can study them for an answer. The paper is freely available on the website of the journal Nature and is entitled “Repeated polyploidization of Gossypium genomes and the evolution of spinnable cotton fibres."